Maria is the second of four children and was born in Ocotlan Jalisco, Mexico, to a farmer and a domestic employee. Early in life she had to face struggles of instability in the home due to domestic violence and financial hardship within the family. In 2009, her mother strove to take the family out of poverty by taking various jobs and eventually relocating to the United States with a sister who lives in Concord, CA. The family’s relocation separated her from family for close to 8 months, and Maria eventually reunited with her mother, siblings and aunt in 2010. She started middle school, learned English within 2 years and simultaneously assisted her family by working in cleaning services, selling food, construction and anything that she thought would increase the family’s income. In Seventh grade, the family moved to San Francisco and Maria moved between San Francisco and Concord, permanently, relocated to San Francisco upon starting sophomore year in high school. During that summer she learned to actively participate in leadership and the importance of community involvement through programs such as Jordan, through engaging in protests and school rallies, and collaborating in an art exhibition about police brutality and freedom of expression. She also participated in internships with National Parks and with Alcatraz. These combined experiences allowed her to learned about injustices and oppression her community faces while reaffirming her belief an individual’s power to change the system. In her Junior year she was deeply involved in community, participating in a walk-out of roughly 400 students, to demonstrate solidarity and demand justice for Mario Woods. The walk-out helped participants to acquire the names of the police officers involved in his shooting within hours. Maria has remained involved in many civic engagement opportunities. She interned with Causa Justa, an organization that helps communities with evictions and immigration: an experience that illuminated the complexities and dilemmas involved in San Francisco’s position as a sanctuary. The semester after, she strived to create an internship to empower more civically engaged leaders within her school and give them a platform to establish change. She helped develop a presentation training in her peer resource class, to inform school staff about undocumented students, which eventually was presented to classes in UC Berkeley and UC San Francisco. She joined SAC to incorporate a Social Justice point of view, where she organized over 90 San Francisco Unified School District students to volunteer in CABE and attended the Cal Poly engineering Summer Program. 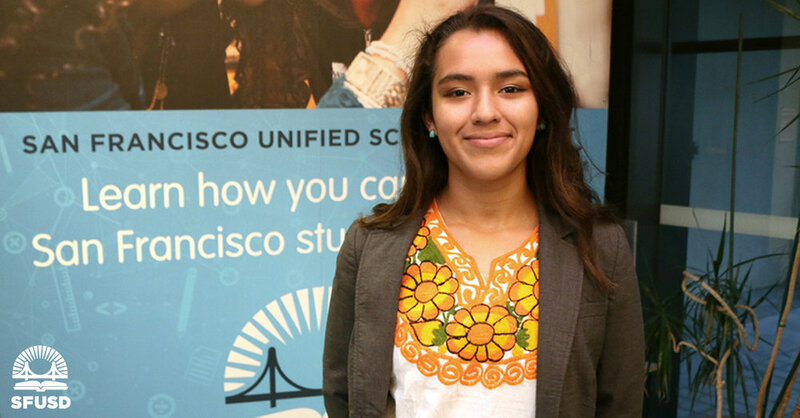 As an elected student delegate, Maria is developing a leadership path for younger students and working to update and strengthen sanctuary city policy within SFUSD. Experiencing adversity as an undocumented student, has inspired her to continue fighting for others who share her status and empower them to create change within the current system. Currently, Maria is applying for colleges and plans to continue helping the community in her future career.